Gabe Burdulis and Althea Grace Roggenbuck formed Future Stuff in 2015 after meeting a few years earlier in Chicago. Burdulis, one of the phenomenal young artists to emerge on the Madison scene out of the Launchpad (now Rockonsin) band competition relocated to Nashville around the same time. Burdulis, who has several solo recordings – a remarkable feat given he’s barely twenty – made immediate inroads in Music City, USA. He wisely maintained his presence on Madison’s music scene however, making frequent appearances as a solo act and with Future Stuff, filling in with the Clyde Stubblefield Tribute Band, sitting in with various other groups like the Mascot Theory and becoming an annual shoe-in to perform at Summerfest. Roggenbuck is keeping pace, releasing her first album at fifteen (she’s still not twenty). She also released a solo EP, Dreamers last year. 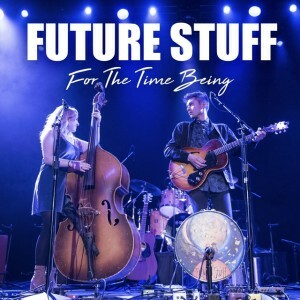 Future Stuff released an EP at the beginning of 2016 (read the review here). A Single, “Act Like You Love Me,” was featured on Spotify’s “Fresh Finds” playlist. Even Sheryl Crow crowed about them on social media. With only Burdulis on vocals, guitar, kick drum and trumpet looping, and Grace on vocals, upright bass, and guitar, the duo made a big sound that quickly caught more fire. They toured with The Black Lilies, Uncle Lucius, and Ike Willis (Frank Zappa) and, more prominently, with Los Lobos and Doyle Bramhall II, a tour that went on for the better part of a year. It crashed earlier this year when the duo posted their intention to take a hiatus just as they were wrapping their debut album. Their performance at the release event on August 10th marks a return to the stage so perhaps there is life left for them after all. Of the twelve songs on For the Time Being, four are re-workings of tracks from their self-titled EP. They are joined by some high-powered session players: bassist Tim Lefebvre (David Bowie, Tedeschi Trucks Band), fiddler Gabe Witcher (Punch Brothers), guitarist Chris Bruce (Meshell Ndegeocello) , drummer Abe Rounds (Andrew Bird, Meshell Ndegeocello) and organist Glenn Patscha (Ollabelle). For the Time Being was recorded at Barefoot Recording in Los Angeles and was engineered, mixed and mastered by Cian Riordan who has worked with such notables as Keith Urban, Slash, 5 Seconds of Summer, Wavves and… Doyle Bramhall II. If all this gives the impression that the album’s sound is not that of a duo, that assumption would be correct. This is a big, bold sound, expertly crafted and arranged. Three major things lift the album above the fray: Wholly energetic delivery, especially the vocals; Burdulis’s considerable guitar skill; and killer songs. Grace and Burdulis’s vocal chemistry is magic, frequently in two-part leads as on the opener “Cold Weather Kids,” a staple for some time in live performance. This song is their anthem. “Just two cold weather kids / Tryin’ to make ends meet; tryin’ to stay downwind / Like we’re warm-blooded inside / Gonna stick together learnin’ how to stay alive / Because all we’ve got is each other / Gonna stick together when the weather gets colder / And all we want’s a little summer comin’ / But ‘til then we’ll keep runnin for each other.” Songs like this are a producer’s dream and Riordan applies nifty effects, heard especially well in headphones. The ghosty, churning guitar rhythm in the song’s bridge, for example, or the thick reverb and chunky tone of Burdulis’s guitar in the return. There’s not a second wasted in this 3:15 gem. This is a fun record to listen to if you know what any of that means or even if you don’t. The two-guitar punch of Burdulis and Bramhall II on “Dollar in My Case” is sweetened further by Patscha’s soulful organ. Bramhall II joins in on vocals for “Road to Guide My Heart,” Grace’s vocal crying used to perfection. The three guitars on the blues/funk “Sunshine,” slink around each other while the Nashville influence comes out on “Time Never Waited for Me.” “Act Like You Love Me” departs drastically from the EP version, moving further into blues territory recalling Jack White with heavily distorted guitars and a solo played through an octave pedal. “Ten Steps Away” is pure ballad ear-candy with Grace bringing the lead vocal home; a radio-friendly knockout with chiming 12-string electric. “In Your Arms,” another song from the EP probably is the closest to the folky duo sound though Bramhall II makes it three-part vocal harmony and the acoustic guitar gets layers in the middle section. “Elephants” – the in-the-room kind – is the only song penned solely by Roggenbuck. Another re-do from the EP, the song features a tasty slide guitar solo from Bramhall II. The closer, Burdulis’s “The Long Road” revisits the swampy blues motif, Burdulis playing a frenetic solo buried in distortion. As one might guess, For the Time Being is a bit of a mashup stylistically. “The Long Road” seems at odds with “Time Never Waited for Me,” for instance. In that way the album’s title is apt; this is a band finding itself, trying out some new things while they have a plethora of talent in the room ready to lend a hand. And who wouldn’t jump on an opportunity to make a record like this, so early in their careers. There are not many who get to, or even aspire to get to, this level of record production. Most simply don’t have the songs to begin with. Another way the title seems apt is that Future Stuff are apparently in limbo. That would be a shame because these two know how to craft a song. It seems a natural part of their being, like having skin. Some things are fleeting, not meant to last, and there is moving on. In this case, that seems abrupt. If there is another recording by Future Stuff there is likely to be plenty of inspiration lyrically, and after going through so much already, perhaps the next one will not require all the sizzle in the production area. But, for the time being, this is a record that plays extremely well on a sunny day.